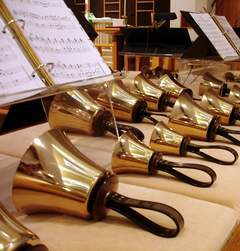 I have been a part of my church’s adult handbell ensemble, Evensong Bells, for about twenty years or so. I like playing bells–it’s a challenge, and people who hear us play seem to enjoy the experience. Generally we play for church services and bell festivals, although we have played for a wedding or two as well. Sometimes people ask us why we don’t smile when we play. Our answer is “Because it’s hard.” And it is, but it’s also fun. Tomorrow evening, some of us in the group are going to play in a unique venue–Nationals Stadium in Washington. Handbell Musicians of America has organized 542 players into a massed ringing choir which will play the National Anthem before the Nats-Marlins game at 7:05. We gather at a church in Alexandria to rehearse for a final time at 1 PM (and believe me, we have been rehearsing. We’re playing this from memory. ), take buses to the stadium, and line up on the warning track five deep and 300 feet across. The logistics of this event are mind-boggling, and we’re told that we will be the largest bell group to do this–in the world. Major League Baseball does not televise the National Anthem before games except for the World Series, but we should be up on You Tube very shortly. If you listen to the game on WFAN-FM, 106.7, Charlie and Dave (the announcers), always feature the anthem and comment on it. This is such an unusual version of it, I’m sure they will have something to say. If you do hear it, please let me know what they thought of it. I actually prefer listening to the game and find these fellows to be knowledgeable and humorous. Whenever one of them spells the name of a player, the technician in the studio makes the sound of an old-fashioned teacher’s bell. I’ve learned to wait for it. If you are at the game, I’m playing Eb4 and F4. Look for me among 541 of my closest bell-playing friends.